Ripped jeans and plaid shirts go so well together. So, why not give the look a try this fall. As you can see, the outfit is casual but can be dressed up with cute boots or high heels. You can get ripped jeans and plaid shirts in all different colors so you can create many different looks. Love plaid but want to glam it up a bit? If so, this next outfit is for you. Here we have a plaid shirt that has been put together with a chic skirt and belt. We love this outfit because it is so stylish. You can put any skirt and plaid shirt together. Keep the colors darker for a trendy, more elegant look. The fall season is the perfect time to invest in a new coat. There are many coats available but if you want a chic look, then choose a coat like featured. It is long and the color will go with everything you already have. A coat like this can also be worn anywhere from work to a special occasion. Stripes look stylish every season. So, why not add the print to your fall look. As you can see, stripes look gorgeous with fall scarves and jackets. Some people may be nervous about trying stripes but don’t be. Stripes look awesome on everyone and you can get different stripe colors and thicknesses. Next, we have a cozy sweater and stylish skirt combination. The red sweater makes a trendy statement while the skirt is must-have plaid. We love this outfit as it can be dressed up or down and it will look amazing throughout the fall and winter. If you want a trendy outfit but want it to be easy to wear then this next idea is for you. The look is made up of a jacket, scarf and jeans. All the colors work well together and the bag and accessories finish off the outfit beautifully. An outfit like this will suit anyone. No fall outfit will be complete without a warm sweater. Our next pick shows a trendy sweater to wear for the season. The color is nice and it will go with everything you have. It will also keep the chill away and it will suit anyone. If you want to make more of a statement, then choose a sweater in a bolder color. Next, we have a cute shirt and jeans combination. We love how the shirt has been knotted at the front because you get the fall look but it has a bit of a summery vibe too. This kind of outfit is perfect for the ladies who are not quite ready to let go of the summer season. Our next look features a very trendy leather skirt. Leather skirts always come back into the style spotlight during the fall and winter. You can go for something stylish like the skirt featured or a more classic black skirt. Wear with a scarf like the outfit pictured or with a cute jacket. Cozy boots are a must-have for the fall and our next idea shows how to wear them in style. Here we have the classic fall plaid with jeans. The two have been paired with fluffy boots. We love this look and it would suit everyone. You can also choose a shirt and boots to suit your own individual style. Last on our list is this super cute fall outfit idea. The look features a cute top with statement sleeves, ripped jeans, boots and a stylish scarf and hat. An outfit like this is glam and will look amazing throughout fall and winter. You can recreate the outfit or use your favourite colors. 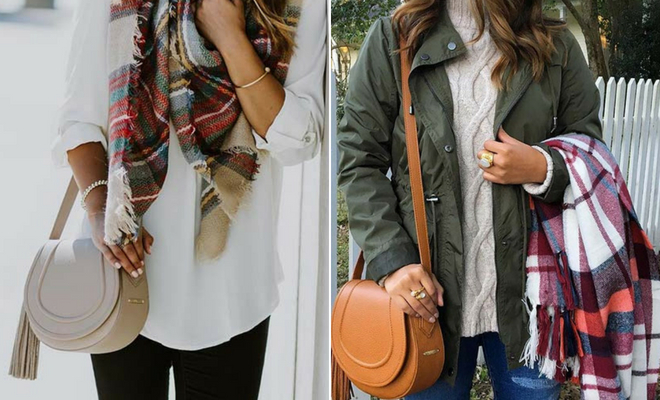 We hope these fall outfits will help you start the season off right.